Manchester City manager Pep Guardiola has hinted at the reason he chose to take the job at the Etihad Stadium despite also being lined up to be Chelsea manager in the past. The Spanish tactician got his City side to produce a memorable display yesterday as they absolutely thumped Chelsea 6-0 to put the future of Blues boss Maurizio Sarri in some doubt. Chelsea don’t have the best track record of showing faith in managers for too long after they hit a rough patch, and Sarri does seem to be struggling to get much out of this squad, with some awful recent away results. In their last three Premier League games on the road, Chelsea have lost 2-0 to Arsenal, 4-0 to Bournemouth, and now 6-0 to City. Speaking after the game, Guardiola said he felt sorry for his opposite number, and explained that he ended up joining City because he knew his bosses would have faith in him there. 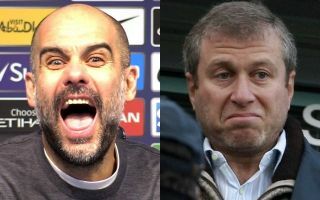 Given that the Telegraph at one point linked Chelsea chief Roman Abramovich with an interest in Guardiola, it could be that he was making a slight reference to the fact that he would never have been given that kind of time and patience if he’d gone to Stamford Bridge instead. ‘People don’t understand how difficult it is. I said many times, my first year was difficult too. Some moments we played good but not consistently,’ Guardiola is quoted by Sky Sports. ‘People expect ‘Okay, manager arrives, he buys players and immediately come [results]’ – it needs time. It depends on the belief from the owners, the people who are in charge; they really need to believe in that. ‘The main reason I decided to come to Manchester City is because my bosses, the chairman specifically, I didn’t have to convince him. He knows me.